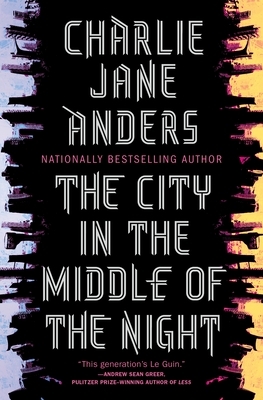 Charlie Jane Anders, the nationally bestselling author of All the Birds in the Sky delivers a brilliant new novel set in a hauntingly strange future with #10 LA Times bestseller The City in the Middle of the Night. "If you control our sleep, then you can own our dreams... And from there, it's easy to control our entire lives." January is a dying planet--divided between a permanently frozen darkness on one side, and blazing endless sunshine on the other. Humanity clings to life, spread across two archaic cities built in the sliver of habitable dusk. But life inside the cities is just as dangerous as the uninhabitable wastelands outside. Sophie, a student and reluctant revolutionary, is supposed to be dead, after being exiled into the night. Saved only by forming an unusual bond with the enigmatic beasts who roam the ice, Sophie vows to stay hidden from the world, hoping she can heal. But fate has other plans--and Sophie's ensuing odyssey and the ragtag family she finds will change the entire world. Charlie Jane Anders is the author of All the Birds in the Sky, which won the Nebula, Locus and Crawford awards and was on Time Magazine's list of the 10 best novels of 2016. Her Tor.com story "Six Months, Three Days" won a Hugo Award and appears in the short story collection called Six Months, Three Days, Five Others. Her short fiction has appeared in Tor.com, Wired Magazine, Slate, Tin House, Conjunctions, Boston Review, Asimov's Science Fiction, The Magazine of Fantasy & Science Fiction, McSweeney's Internet Tendency, ZYZZYVA, and several anthologies. She was a founding editor of io9.com, a site about science fiction, science and futurism, and she organizes the monthly Writers With Drinks reading series. Her first novel, Choir Boy, won a Lambda Literary Award.